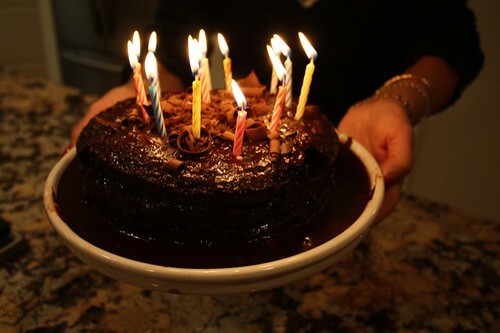 This cake is not your typical chocolate cake; in fact, it's more like a brownie. It's squishy and squidgy and dense and rich, and it's topped with a puddle of ganache that spills down to form a sort of moat around the outside of it. 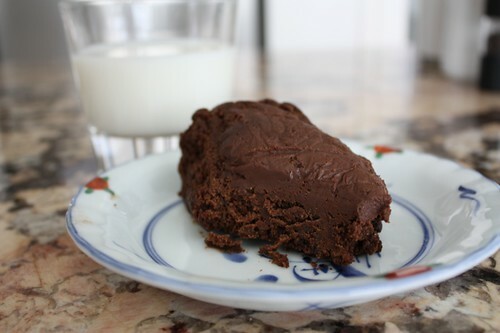 And then when you refrigerate the leftovers, the ganache becomes a thick wedge of solid chocolate that hardens on the top of the cake, and when this happens, there is nothing for it but to consume your final slice with a cold glass of milk. The recipe is here, in case your pants aren't tight enough and you need some fattening up. You will note that it's a British recipe---BBC in the house!---which means you're going to need to convert grams to ounces (or cups) in order to make it. I am a terrible enabler and so I have even found you a handy conversion calculator to help with that. This cake is going to change your life, you watch. Fine, I finally fit comfortably into prepregnancy jeans and you go and post that? I wanted to STAY fitting in those jeans. On the other hand, pregnancy turned me off of chocolate, so I do still need to make up for nine months of chocolate I didn't eat. Well, at least I'll die fat and happy. Thanks for that. So glad I got that oven fixed. Next time you are in San Diego, you must go to The Mystic Mocha (http://www.yelp.com/biz/mystic-mocha-san-diego). This is the best breakfast place in SD by far (but be warned: it's small). Best (and craziest) muffins you will ever eat in your life. Can you tell I miss SD? Holy moly, I think the button on my pants popped just looking at that cake. I think I need a slice! Wow, now that is a cake! My husband asks for brownies for his birthday every year, but I tell you what this year I'm not asking him I'm just going to make this cake. I have a feeling it will be a big enough hit to make him forget about the brownies for at least a couple of years! I've been looking for a cake recipe that's more like a brownie for a little while now since I don't really like the texture of cake, and here you go & post. Thanks so much, me and the 10-15 lbs I will be gaining from one slice will be over on the couch. I think I gained weight just looking at it. That cake looks divine! Thankfully I cannot bake to save my life so I won't be eating it anytime soon (and my midsection is thankful). according to the recipe, there are 14 servings in this cake @ 541 kcals per serving. Multiply by 1000 to convert kcals to calories (541000 calories per serving??). Could make a bit of a dent in your daily allowance. That looks fantastic. I would like a piece RIGHT NOW! I glad reading your site. That cake looks delicious, I'm hungry now!